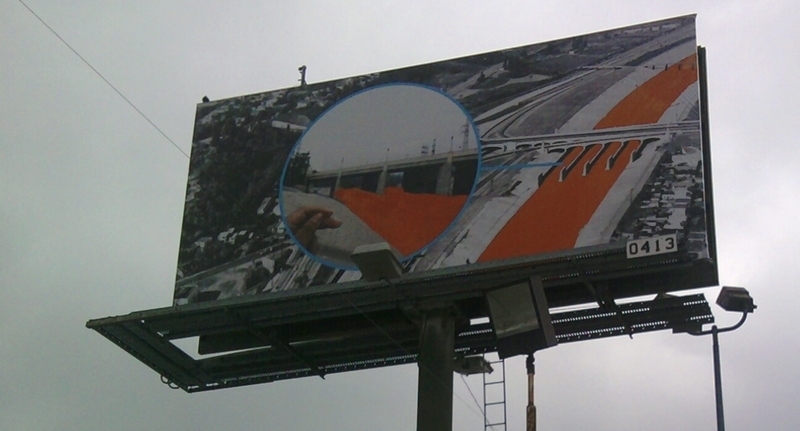 What’s Up with Orange L.A. River Billboard? 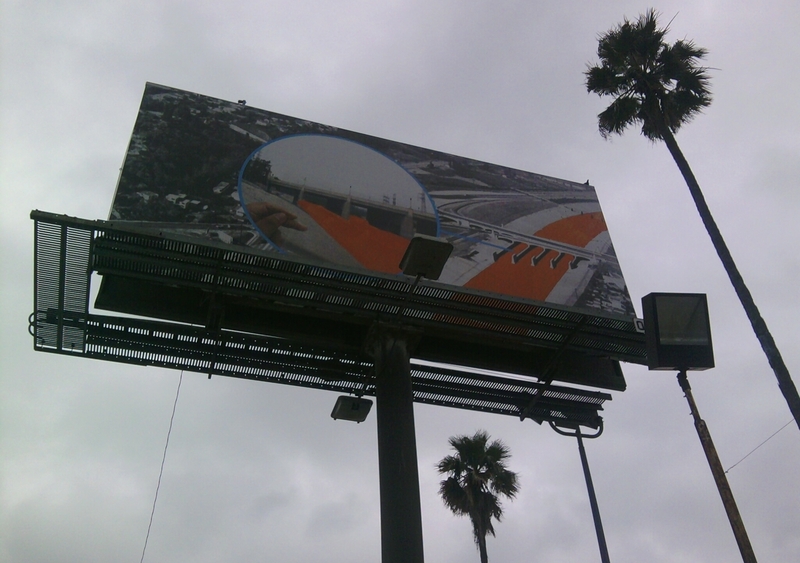 Somewhat random post here… but do any of our eagle-eyed readers know what’s up with this Los Angeles River billboard? I spotted it yesterday… not sure if it’s a series or a one-off. It’s facing north on the east side of Figueroa Street at 39th Street – across from “Christmas Tree Lane” in Exposition Park. It shows a larger historic black and white aerial photo of the L.A. River in Atwater Village, mostly focused on the Glendale Hyperion Bridge (officially the Victory Memorial Viaduct.) That 1928 historic bridge is fairly easily recognizable from the Red Car trolley pier walls extending downstream. In the frame is a smaller second image, cropped circular, with a blue arrow pointing to spot in the larger image. In an example that’s maybe a bit similar to what Riparian Rap blog calls geomorphically incorrect art, though the arrow points to the Glendale Hyperion Bridge, the circular insert detail is an image of the 1927 Fletcher Drive Bridge. In both images, the water and the bed of the river have been painted orange. Anyone know what this is? Are there any more around town? Is it street art? or a sleeper campaign for a new orange soft drink? Let us know what you think in the comments below. § 12 Responses to What’s Up with Orange L.A. River Billboard? Oh, National Orange Juice Day is coming up. Thank the gawdz it’s an art project and not a campaign for Fanta or Orange Crush. So their vision is an orange river? Love the new layout but could the posts carry by-lines? Ah, I see the Meta column now. Very discreet. not much we can do about that, unless we change formats. Sorry for the confusion! AWC is a joint venture between California Institute of the Arts and California African American Museum, and offers students from across Los Angeles-area high schools the opportunity to engage with established artists. The collaborative promotes an understanding of the conceptual art process and the major role art can play in students’ own lives and communities. Artist and educator Charles Gaines, initiated the project, and was eager to create a curriculum offering younger art students both the opportunity to learn something beyond technical art skills and the chance to work with established artists – a valuable opportunity he was also given as a teenager. The students were given the opportunity to work in either one of two classes: The Visual Arts Course or the Video and Photography Course. Initially students met with Los Angeles-based artists Ruben Ochoa and Rodney McMillian to receive a set of rules and project framework to guide their efforts. In each of their respective classes, students were then challenged to conceptualize and collaboratively produce a work within this framework. Artists Nikki Pressley and Kenyatta Hinkle instructed the Visual Arts Course, working with students Luis Ayuso, James King, Gary Lim, Avery Ingram, Barbara Hernandez, Elmast Kozloyan, Danny Sanchez and Jesus Santacruz to produce a series of works engaging notions of identity and voice. The series consists of 20 painted panels, a lightbox and performative element. You are currently reading What’s Up with Orange L.A. River Billboard? at L.A. Creek Freak.